Anyone who uses Prismacolor pencils knows the deal. You buy a box of assorted colors, and the first ones to go are the black and white pencils, then the flesh tones (in my case), and of course Indigo Blue. The rest of the box dwindles at varying rates, and some never get sharpened at all. I've actually had my same box of Prismacolors since high school, and they have served me well. I feel like buying a whole new tin now (they came in cardboard boxes in my day) would almost be like cheating. Thankfully, Prismacolor is and - to my knowledge - has always been aware of the different rates at which their pencils are used. As such, art supply stores have a little display where you can buy each individual replacement pencil you might need. The only problem is that I always seem to arrive at the art store right after someone has replenished their stock of black pencils. Since I've been working on some black and white drawings this week, I knew I was going to be needing some more pencils. But why should I break up my work day to go to a store that only has two black Prismacolor pencils in stock? I shouldn't. Then, I realized this was the perfect time for Amazon Prime. On Amazon, you can purchase a dozen Prismacolor pencils in the same color, and they come to you in a neat little box and are already sharpened. Mine were delivered right to my door, saving me the distraction of a complete, mouth-watering tour of the art supply store...because those are dangerous sometimes. Besides that, though, there was just the magnificent feeling of opening a box of freshly sharpened pencils. 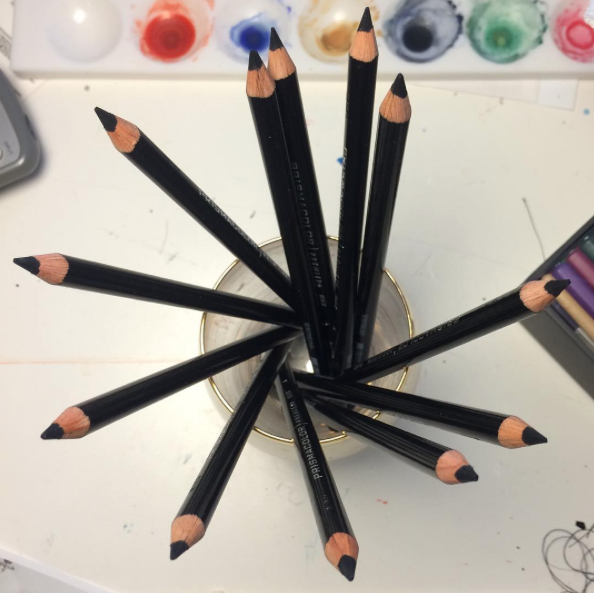 So, if you're in need of a treat today (or, well, if you can wait two days for a treat), then I highly suggest purchasing yourself a box of monochromatic pencils. They'll boost your endorphins and last longer than roses. Happy Friday!